to the other side. Please also include the length from the throatlatch to where the noseband would sit under the horses head. This leather halter has ribbed web cheeks, nose, and jowl. On either side of the crown the bridle leather chapes, secured with Chicago screws, are designed to break away and release the horse in case of accident or bridle entanglement. chapes attach hardware to the web. Leather throat, crown and chapes. Chin is adjustable. Swivel bolt snap on rolled throat can be snapped facing in or out, allowing the rider to choose. All hardware is solid brass. Leather is natural, un-coated, unpainted and will mellow and darken as oil and preservatives soak into the leather. The leather is tanned in a "green" tannery which meets all European environmental standards. Crown - 27" to 30"
Rolled Leather Throat with Snap - 19"
This Smith Worthington Halter has their Wexford quality leather halter with softly padded crown and nose. Solid brass hardware. Rolled throatlatch and an adjustable chin. 1" wide. Large Draft Size: PADDED CROWN - 26"-29", CHEEKS - 11", PADDED NOSE - 30"-32", CHIN(leather only) - 6 1/2", THROAT(leather and snap) - 20"
Small Draft Size: PADDED CROWN - 21"-26", CHEEKS - 9 1/2", PADDED NOSE - 28"-32", CHIN(leather only) - 7", THROAT(leather and snap) - 19"
A practical heavy duty Amish made leather halter. 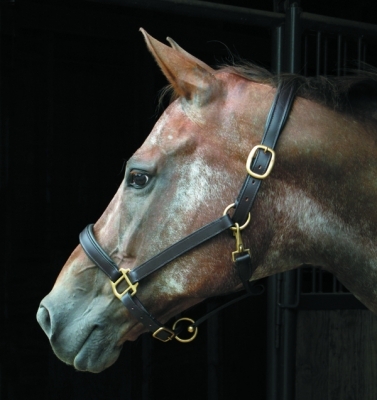 The USA MADE halters come in 24 colors, with brass plated hardware. 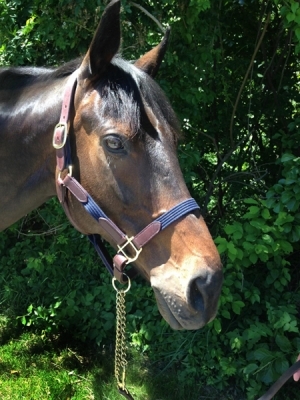 Custom design your own halter by adding a Designer Trim from the ones pictured below to the basic halter you purchase. 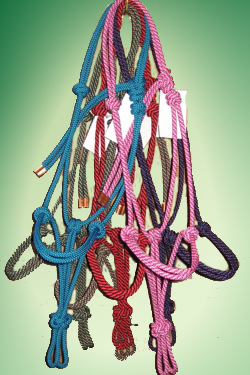 Some Designer Trims are available as an All Over Design. If you choose one pick "ALL over Design" as a color option in place of a color. 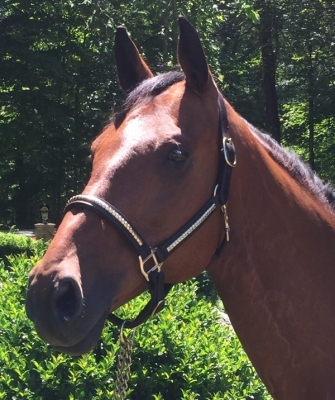 Crown - 20" to 25"
Crown - 19" to 24 "
Throat connection - 6 1/2"
Crown - 17" to 22"
Crown - 19" to 24"
For the 2500 pound draft, select the draft size above, and add this option for an extra large size draft halter. Crown - 24" to 29"
Throat connection - 9 1/2"
EXTRA LARGE DRAFT: 29" - 34"
If you need a bigger for any RONMAR nylon item or one of the measurements of your horse does not fit into the standard measurements for our Draft, or X-Large Draft, or other standard size please add this item box. On the Cart Contents page in the Ordering Instructions box write out the changes that you need. As always, you can call us 10:00 - 4:00 pm Monday to Thursday if you are unsure. 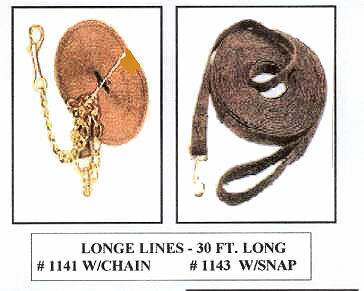 Matching 7 Foot lead with brass colored snap. Please specify color at checkout. Order trim for leads from pictures below. Colors: Rasberry/Pink, Powder Blue/Royal Blue/Silver, Tan/Medium Brown, Navy Blue/Kelly Green/White, Red/Orange/Yellow, Hunter green/Brown/Black, Black/Silver, Pacific Blue/Kelly Green/Yellow, Lime Green/Purple/Pacific Blue. This dressy leather halter with softly padded crown and nose. Solid brass or nickel plated hardware will never rust. Rolled throat latch and adjustable chin. 1" wide. Clinchers at cheeks and nose. Affordable and nice enough for showing. A great value. Imported.